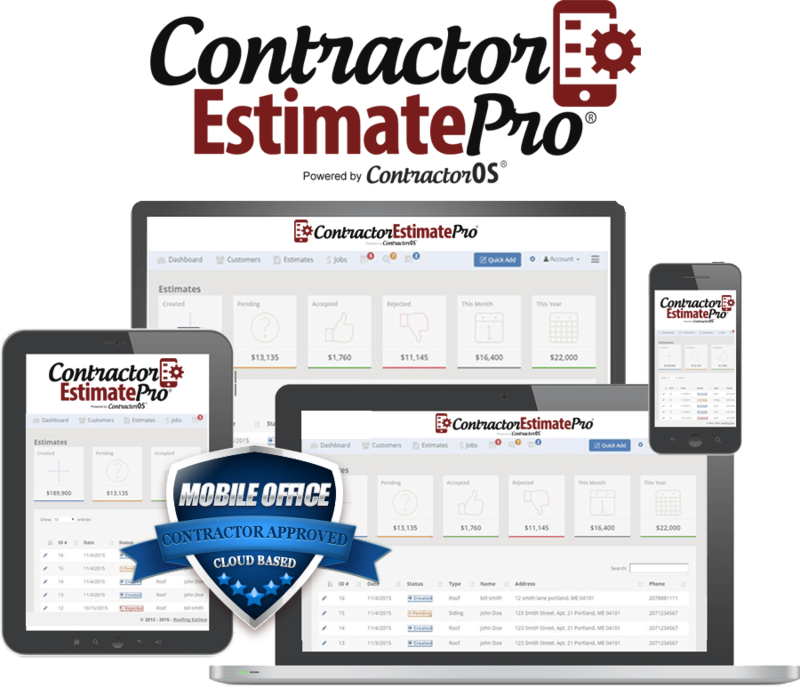 Because ContractorEstimatePro is both Mobile Responsive and 100% Cloud Based means you can take your office on the job site with you. No software to download and no worrying about data backup. We take care of all of that. You simply setup your business once, and we handle the technical pieces for you. AND getting setup is a snap. One of the best features of ContractorEstimatePro is it’s versatility and ease of use. You don’t have to be a rocket scientist to get setup and managing your business quickly. Your website is connected directly into your software so all your leads are automatically imported into your mobile office. This makes follow up and closing sales a breeze. Easily create estimates and proposals and send them off to your customers via email in minutes. This saves you time and gives your business a professional image. Your software interface will be setup with your company brand and logo so whenever you send a document you’ll showcase your company with utmost professionalism. Setting up your customers in your software is a simple process. You can add any new customer manually, or import an entire customer database from another program. Stay organized and efficient with the built in appointment scheduler and job calendar. PLUS send yourself and your customers reminders delivered via email or text. Stay informed about the health of your business with our detailed reports. From a financial overview to just knowing what jobs are scheduled for the week, you'll have access to everything about your business. Keep track of all your leads and easily manage them directly within your software interface. Run detailed reports and update their status with a few clicks. Upload project files, job site documents, photos, and more directly into your online file cabinets. Then access them anytime you need them. Scan and upload too. Customer data is integrated directly into Google maps so finding an address or getting accurate directions to a job site has never been easier. Add your product and supplier information once then easily refer to it over and over again. This is a huge time-saver and allows you to create more accurate documents. Manage all of your workers, sub contractors, and sales people in one convenient location inside your mobile office. Send deadline alerts, quotas and more. Easily integrates with Quickbooks, Square, Paypal, Docusign and many other third party service providers. Have an integration request? Just let us know and we'll be glad to help. Easily and efficiently keep track of your jobs, work in progress, scheduled tasks to be completed and more. Also integrates with all your sub-contractors and sales team. Upload and store unlimited job site photos to use on documents and proposals. Take a picture on your smart phone and add it to your photo collection or client profile. Although you’ll find most of the documents and proposals you’ll ever need already created for you, you can easily customize or create a new template with ease.